Written by CMOS Bulletin SCMO on June 13, 2018 . Posted in Atmosphere, Weather, What's Current. The first, and the most fun of the atmospheric phenomena, is the green flash. This is a rare optical phenomenon that occurs shortly after sunset, or before sunrise, when a green spot is visible for an instant just above the sun. It is usually seen on an unobstructed horizon, such as over the ocean or a large lake. Remember, even when the sun is setting, it is dangerous to look directly at the sun. While waiting to see the green flash at sunset, look away until only the very top of the sun is about to disappear below the horizon. It is only during this last instant that the green flash will be visible. The green flash is seen only when it is absolutely clear all the way to the horizon – so don’t expect to see it every night! Why does the green flash happen? The basic cause of the colour is atmospheric dispersion. Light travels in straight lines in empty space but not when light interacts with matter. Refraction is what happens when you put a pencil in a glass of water at an angle. When you look at the pencil, it appears to be bent at the surface. This is the same for light in the atmosphere. The refraction of light by the air is larger for shorter wavelengths. At sunset the refractive delay of the sunset is usually a second or two longer for blue and violet than for red. So, the red image of the sun sets first, followed by the yellow, the green, the blue and finally the violet. Someone may ask why we don’t have a violet flash? This is because of atmospheric extinction. Air molecules and dust scatter the short wavelengths most strongly. This is why the sky is blue. The scattered blue light goes in all directions so we see it everywhere. At the horizon, the length of the path through the air is very long and the shortest wavelengths are almost completely removed. Usually there is just enough haze in the air that both violet and blue is completely removed, so that the last thing we see at sunset is the green. So, watch the sunset with your friends – but be patient. Another set of summer atmospheric phenomena, red sprites and blue jets, are associated with storms. We live in a world with many different forces interacting. We have electricity, wind and atmospheric pressure. We have plasmas. And we have combinations of all of these which, when they go together in the right way, can create some very strange things in the atmosphere. One of these strange combinations produces red sprites. Red sprites are weak but very large red flashes that occur in the sky above active thunderstorms. Many people have seen things that were probably red sprites over many years, but the first actual images were captured in 1989. Red sprites only last a few thousandths of a second. Luckily, they do not seem to occur alone but rather in clusters of three or more making them easier to see. And since this phenomenon is so new, there is still no official explanation for the cause of these flashes. The evidence points to their creation by the discharge of positive energy, left over from a cloud-to-ground lightning strike, in the decaying portions of storms. Another combination of forces that is closely related to red sprites leads to blue jets. Blue jets are observed in the same kind of storm settings as red sprites. Blue jets are upward cones of blue light that appear to be coming out of the cloud above the thunder storm. Blue jets are not directly related to lightning as red sprites are thought to be. And blue jets occur much less frequently. Again, scientists are not sure what causes blue jets but think that they are related to the collection or discharge of energy from lightning storms. The bright blue colour is thought to be related to molecular nitrogen colliding with oxygen. Crepuscular rays (also known as God Rays) are rays of sunlight that appear to be coming from a single point in the sky. They are often known by other names, like “sunbeams”. 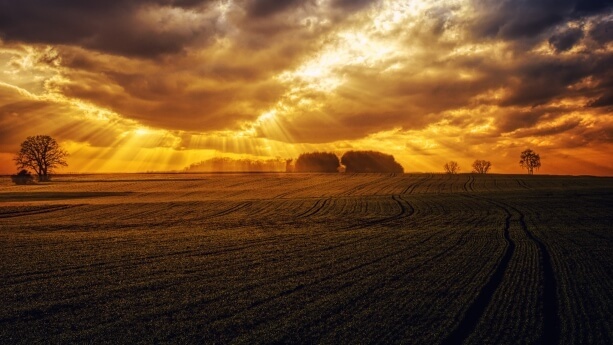 There is an ancient Greek belief that sunbeams can draw water into the sky and are known as “Sun Drawing Water”. This is perhaps an early explanation of evaporation. Nautically, these rays are called “Backstays of the Sun” after the name for the lines (stays) used to brace the mast of a sailing ship. There is also a Maori tale about one of their culture heroes (known for his exploits and trickery) restraining the sun with ropes to make the days last longer. They are also known as God Rays or Fingers of God because they often appear in the backgrounds of religious pictures. And there are many other names associated with deities like Jesus Beams, Buddha’s Rays and Divine Light. Jacob’s ladder is described in the Book of Genesis as a dream which Jacob has during his flight from his brother Esau. The early Christian Church describes it as the “ladder of ascent to God”. The Jewish Biblical philosopher Philo presents his interpretation of the ladder as souls ascending from bodies or the ups and downs of life or the continually changing affairs of humankind. The Muslim scholars see Jacob’s ladder as representing the essence of Islam, which emphasizes following “the straight path”. Our modern culture often references Jacob’s ladder – a 1980s song by Rush, a 2002 song by Chumbawamba and a 2011 song by Mark Lanegan. It is also featured in the video game RAGE by id Software. There are three basic forms of crepuscular rays – rays coming through holes in low clouds (also known as Jacob’s ladder or Stairway to Heaven), beams of light diverging upward from behind a cloud, and pale pink or red rays that seem to come from below the horizon. They are commonly seen near sunrise or sunset and are associated with tall clouds or mountains. But they can also be seen inside churches and cathedrals with the rays shining down from high windows. Crepuscular rays are usually red or yellow in appearance caused by the scattering of blue and green components by particles in the air. 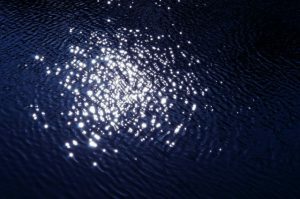 Sun glitter is the bright, sparkling light of sunlight reflecting off water waves. Even a ripple from a thrown pebble can create a momentary glitter. Sunlight reflects from the smooth surfaces of the water. A rippled or wavy surface still has locally smooth parts. A wave will reflect the sun at a different angle at each point on the surface of the wave. If the viewer is in the right location, he/she may see many small images of the sun from the rippled surface. The exact pattern seen by the viewer depends on his/her location and the colour and length of time the glitter can be seen depends on the altitude of the sun. The lower the sun is in the sky, the redder and longer the glitter. Sun glitter can be as damaging as looking directly into the sun, so observers should be cautious when looking at it. Sylvanshine is a summer nighttime optical phenomenon. It happens when dew covers the waxy surface of certain tree species. The dew forms beads because of the waxy surface and the light from your headlights is focused by these beads of water (acting like lenses) to a bright spot on the surface of the leaf. When this bright light is reflected back toward your car, it looks like snow-cover on the tree on a summer evening. Fata Morgana is a type of atmospheric phenomeon that is also the name of a psychedelic alternative rock band, apparently one of the best that you can hear! Or it could be the name of an art show in New York about which Yoko Ono said “I think all women are witches, in the sense that a witch is a magical being”. Or it could be part of the war in Pakistan where FATA stands for the Federally Administered Tribal Areas. But I want to tell you about the Latin Goddess of Fate (fata). Morgan le Fay was the fairy shapeshifting half-sister of King Arthur and her name in Italian is fata morgana. A fata morgana today is an optical phenomenon which is caused by a temperature inversion. It is usually seen in the morning after a cold night (caused by the radiation of the earth’s heat into space during a clear night). The fata morgana is a form of mirage that makes islands, or ships or cities appear elongated and elevated like fairy tale castles. In this case the object being seen is visible even though it is beyond the horizon. It was long believed that this mirage was caused by Morgan le Fay’s witchcraft. But really, it happens in calm weather when warm air lies on top of cold dense air near the surface (like over the lake). The surface between the warm layer and the cold layer acts like a refracting lens, producing an upside-down image and the distant direct image seems to hover over this lens. The mention of this phenomenon occurred in 1818 when it was observed over the Strait of Messina, between Sicily and Calabria. This type of mirage is called a superior mirage and it is different from the inferior mirages that produce what looks like water on the road ahead. The effect is like putting a mirror just above the horizon and the object seems to be doubled – one image above and one below the mirror identical with the first. Summer is the time to watch and wonder about mirages. If you like sky watching, then mirages can provide a whole new perspective for you. For years, you may have been watching superior (over the horizon) mirages (like sunsets) without even realizing what you were seeing or not seeing! Just think of the interesting stories you could tell your children about seeing cars driving down the streets of a city that couldn’t possibly have been seen across the lake! An editor acquaintance thought himself going crazy and asked me about it. And how many UFO’s may have been seen caused by car headlights located below the horizon that may have been magnified by very strong superior mirage conditions seeming to move rapidly though the sky and just disappear as the car turned a corner? That UFO might really have been a VBH (Volkswagen Beetle Headlight)! Now that you know what to look for, take the time to enjoy the atmosphere, especially at night when the conditions are right for mirage formation, and you may witness some amazing things. And you’ll get a feel for the things our ancestors created legends about!